Continuing our look at the very best music software, Digital Audio Workstations (DAWs), sequencers and samples/Virtual Instruments (VI’s), Synthogy’s Ivory II is found firmly to earn a place at the top of the list. 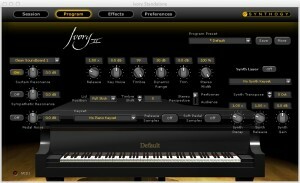 Ivory II is a Virtual Instrument (vi) – a large set of sophisticated high-quality sound samples of the concert piano. It can be used as a standalone application, which has a sophisticated yet easy-to-use single window interface; this was custom built with its own DSP engine and worked extremely well during testing. The piano samples in Ivory II also function as a bespoke plugin soundset for sequencers, DAWs and notation software such as Sibelius 7. The latter was concentrated on during this evaluation. Three are the criteria by which to evaluate software like Ivory II (the “Grand Pianos” version was used here; also available are “Italian Grand” and “Upright”): installation and integration with the system/environment; the sound produced; and features. Although the writers of Ivory II‘s documentation, which takes the form of a PDF manual and printed 92-page book(let), have gone to great pains to describe the installation process as expertly as possible, it can still be a little unclear (particularly for those new to Ivory II). Pages 8 to 10 of the latter explain that you may have to specify two target destinations: one for the Ivory II software; and one for the data (its large sample libraries). But if for some reason your system, the type of installation you choose and/or the fact that you are upgrading, for instance, skips the first opportunity to specify the location for the application itself, you may still be left wondering whether you should indeed actually have told the first of two installers that you did in fact want the Ivory II system and application files to reside in your boot volume’s /Application folder. Instinct rightly tells you that this is the logical place. But even after specifying an external hard drive for the samples (as is almost always recommended in these cases) you see the aforementioned PDF document(s) appearing on that external drive; and may worry! This could have been avoided by making it a little clearer that the data always goes into a folder called ‘Ivory Items’ and that the the Ivory II programs/software/’system’ installer can be left to use (its) defaults). With a typical installation handling between 22 and 77 GB of data, spanning up to 11 DVDs and taking several hours (in this case six – on a fast ‘mid-2011’ iMac with 16 GB RAM), it’s not something you want to have to do more than once. In fact, after applying the update to take Ivory to version 2.0.5 for Lion compatibility, the application did appear to “forget” where its samples were and it was necessary to run the Ivory Library Tool in order to re-associate the data with the app. This tool worked well, though – all very straightforward and streamlined. Still, it has to be assumed that users of this software may have to do a bit of digging and experimenting at this stage. But nothing like so much as with the VSL and XCE products looked at previously on MyMac. And Synthogy is updating the documentation to help here as well. They are aware of these ambiguities and seem committed to eliminating them. You’ll need the iLok USB hardware key (or similar) to install and run Ivory II. Although costing and extra $49.99, it can then be used to authorize several comparable products. Once installed successfully, setup of Ivory II itself could hardly be simpler. Unlike the Vienna Instruments sounds, Ivory takes care of everything inside Sibelius… “Test device” and the presence of “Ivory” in the Mixer will reveal that. Create a new Device (“Ivory”); set its SoundSet to “General MIDI”; leave “Use manual sound set” unchecked (at which point Sibelius is likely to offer “keyboard.piano.grand” as the sound ID). That’s it. You’re ready to start using Ivory II from within Sibelius; the changes you thus make in the Ivory II console are immediately heard in Sibelius in the same way as this “round trip” works in many such plug-ins. During an extended evaluation period, this “handshaking” worked perfectly (transparently and reliably) every time. 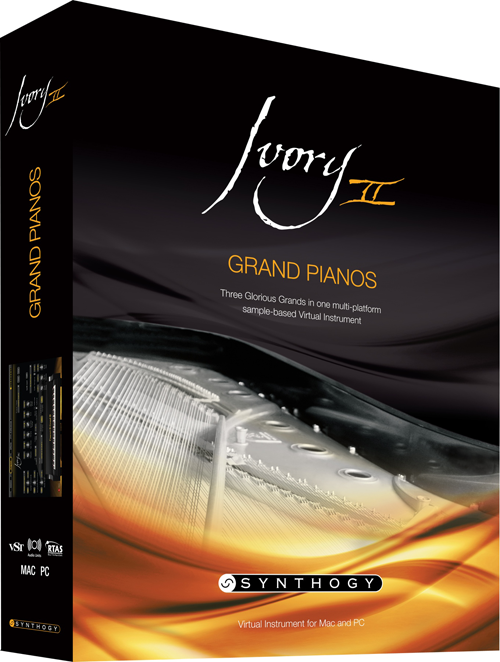 Ivory II “Grand Pianos” builds on the success, resilience and quality of Synthogy’s earlier product. Ivory II has a much-expanded set of piano sounds… almost twice as many velocity layers as the previous version. The new Ivory II piano DSP engine supports a broad range of expressive qualities in the piano – from stroking the keys pianissimo to extrovert fortissimo playing. It really does suit most styles of playing. For all the piano’s percussive qualities, it is also a deeply harmonic instrument… strings should excite harmonically resonant strings when struck. This has long been difficult or impossible to achieve in a vi. Synthogy’s “Sympathetic String Resonance” technology employs “Harmonic Resonance Modeling”. But it doesn’t trigger either additional samples or synthetic sine waves. Instead, the actual overtones contained in the base note’s matrix. This is essentially how acoustic piano strings themselves work. Again, a real advance for the product, and one that proved impressive during evaluation of Ivory II‘s sound. Other piano “effects’ which are implemented very successfully in Ivory II for the first time include half pedaling, lid position and pedal noise. Tuning tables adds to realism by allowing you to set alternative tunings. Silent Key Velocity, on the other hand, sets a threshold under which a sound will not be triggered; useful in tandem with the Sympathetic String Vibration. There are up to 18 velocity levels per piano, more soft and release pedal samples. Synthogy’s proprietary “timbre interpolation” technology adds to the sense of faithfulness in the sound as well. Indeed, the enhanced Release Samples for each key add a truly realistic and very pianistic sound to your playing – a far cry from cheaper thin, imitative keyboards. This is as close to the real thing as it gets. In fact such features as the samples for damper and soft pedal add to the subtlety with which you can get sounds from Ivory II; you really can concentrate on music-making and forget the technicalities, knowing that they’re also all there in all flexibility as needed. Under evaluation, all these performed every bit as well as you would imagine from a product of this pedigree. When you consider that each of the conventional piano’s 88 keys has been individually sampled at up to 18 dynamic levels (the Bösendorfer also has an extended low octave), and that Synthogy’s “Sample Interpolation Technology” is again used for transitions between velocities and notes, it’s hardly surprising that they sound as good as they do. The layout of the plug-in application with its four new menu items (“Session”, “Program”, “Effects”, and “Preferences”) is logical, ergonomically sound. (After all most “computer musicians” have to have four hands – a pair for the QWERTY and a pair for the musical keyboards!) The “console” is easy to read, although the font is a little small in places… that’s almost inevitable with complex graphics and audio software. You quickly get used to it, though, and finding your way through Ivory II‘s features becomes quick and natural. Fortunately, it also encourages experimentation… saving acoustics/concert halls etc; altering other ambience settings; changing EQ; watching instant arc feedback and so on. In short, there are no parameters associated with the piano that even experienced performers, musicians and composers will want but which the excellent Ivory II does not provide. The aesthetic appeal, the design, of the standalone interface are truly appealing in their own right; it has been thought-out so well that it sponsors true musicianly work at every turn. It’s a remarkable blend of depth of features and simplicity of use. The quality of sound achieved by Ivory II is extremely impressive! 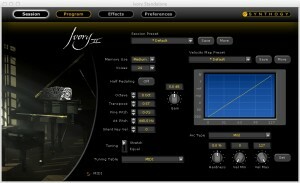 Ivory was the first really high quality piano vi (virtual instrument). Just as the piano was notoriously difficult to record on tape because of the sound’s susceptibility to ‘wow’, virtual pianos can (and often do) sound “tinny”, thin, insipid and weak. If you’re at all serious about working with synthesized piano instruments, then you need something of greater sonic stability, realism and depth (see above). Ivory II can convincingly claim to be such a world standard for such sound. The earlier version quickly became the virtual piano of choice for many musicians able and willing to spend $350 on one instrument; and ready to invest a relatively modest amount of time in learning its use. Now Ivory II has taken over and amply fills that slot. Its sound is nothing short of superb – good enough for regular public performance, for the most demanding of composers and students etc as well. The features and advanced technologies built into Ivory II each meets a precise and intelligently-identified need. Singly and collectively they enhance the flexibility, realism and ease of use of the instrument. Interestingly, prolonged use of Ivory II reveals almost by itself just how many musical worlds the piano can evoke. Synthogy has produced a musician’s instrument. 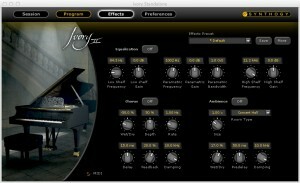 Conclusion: Easily the best, most flexible, realistic and pleasing piano sound available as a virtual instrument, Ivory II is by and large easy to install and use in a variety of environments and third party software. If you’re looking for authentic, solid and versatile piano, Ivory II will fit the bill in 99% of circumstances. It combines with great suaveness an extended set of features with robustness and ease of use. Cons: Expensive; but for what it can achieve, justifiably so; the aforementioned small shortcoming in the documentation. Any AU, RTAS, or VST 2.0 plug-in host, or the included Ivory II Standalone application.